This week, i've had lots of visitors come and see me while i've been working, - and it's always lovely to show people round, and hear their compliments about what they like, and how much work has been put in. This week started with a visit from the Chair of the organising committee for the East Clandon in Bloom team, with a thank you letter to let me know that there had been 500 visitors over the 2 days, and 90 for the Saturday night concert. That means that FROST, have raised a wonderful total towards the funding of the Village Church, and that there were a huge number of satisfied garden visitors. Then I had a visit from Jane Rickard. She is a member of the West Horsley Flower club, and is doing the floristry demonstrations at the West Horsley Fete on the 7th September, - with some of my flowers. This was one of her creations with some of the blooms I gave her. If you want to win a creation like this, - you'll have to come along to the Fete, in the grounds of Dene Place in Ripley Lane, on the 7th September. Then this morning I had a visit from Rona Wheeldon of Flowerona. I met Rona several years ago, and was impressed with the floral displays she used to decorate a launch party I went to. I've been following her blog Flowerona since it started, and she's a great user of social media to promote flowers in general. It was through her blog, that I found out about Flowers from the farm, and through that I found the courses I went on last Autumn about growing flowers, and the rest, as they say is History. Although Rona's main aim of the morning was to take some pictures of my flowers, we did end up Chinwagging for rather a long time. I'm so grateful to Rona for all her sound advice, ideas, and to do list, - i've come home very inspired, planted lots of seeds and taken cuttings, - changed my outdated telephone message, updated my Instagram programs and profile, written a list of things I need to change on my website, and started planning a florists open day. I was rather chuffed that I managed to present her with some scented flowers that she didn't know (Acidanthera), Appropriate as they are a cousin of the Gladioli that she had written about on her blog this morning. I'm even more pleased that she's featuring our Plantpassion interview on Flowerona, - hopefully it will be live at the beginning of next week. 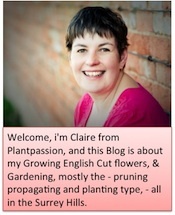 She has a whole section about #britishflower growers which is well worth a read. After a holiday break in France, I got back on Friday, just in time to do a massive picking session, so that I had plenty to sell at Yesterday's Ripley Farmers Market. It was the first farmers market that i've done. A couple of school fete's have given me some starting points, but I chose a slightly quieter than normal summer market in the local village of Ripley to get me started on the bringing #Britishflowers to the Surrey public. I remembered to take this photo, as I was setting up, of the range of flowers I had for this month. The bunches of Sunflowers, Cosmos, Dahlias and Gladioli were the favourites, but my table top arrangements sold well, and I made up bouquets to show off some of the lovely flowers I didn't have quite so many of. I'm booked to do the next 2 as well on Saturday 14th September, and the 12th October, so if you want bunches of seasonal flowers, please stop by and say hi.